Stephanie graduated with a Bachelor of Physiotherapy from the University of Queensland in 2007 and has been working as a musculoskeletal physiotherapist within Allsports Physiotherapy since then. Stephanie has been working at the Camp Hill clinic and balances her Physiotherapy clinical load with the instruction of Pilates. 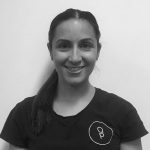 Stephanie has a special interest in the treatment and rehabilitation of pelvic and SIJ dysfunction but also has a particular interest in ballet and dance-related injuries. She loves being able to see her patients transition from an acute phase to a strengthening and preventative management phase through the use of physiotherapist-led exercise.